Home > Oil, Chemicals, Utilities > Power / Electric K - Z > United Water Resources Inc. 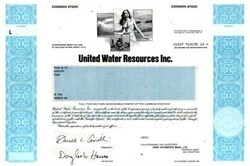 Beautifully engraved specimen certificate from the United Water Resources Inc. . This historic document was printed by the Banknote Corporation of American and has an ornate border around it with vignettes of an allegorical woman, a dam, a microscope, and a mountain valley. This item has the printed signatures of the company�s president and secretary.